(From left) Martha Scott, Jeanne Galatzer-Levy, Abby Parisers, Sheila Smith and Madeline Schwenk were among the seven members of Jane arrested in 1972. Abortion is one of the most divisive issues in American life and politics. 45 years after Roe vs. Wade – our country is still split. It’s easy to forget that it wasn’t so long ago when abortions were illegal everywhere in the United States. In 1965, an underground network formed in Chicago to help pregnant women get abortions. At first, they connected women with doctors willing to break the law to perform the procedure. Eventually, they were trained and began performing abortions themselves. 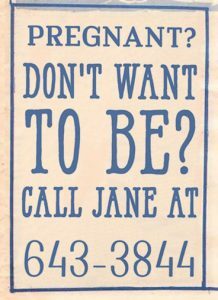 The group called itself “Jane.” Over the years, Jane performed more than 11,000 first and second trimester abortions. Thanks to the team at NPR’s All Things Considered, where this story was first broadcast. For more info check out Leslie Reagan’s book When Abortion Was a Crime and Laura Kaplan’s, The Story of Jane.